Charlotte Cowan MD Honored By Obama Administration For Innovative “DR HIPPO” Series Of Children's Books! CONCORD, Mass. – July 01, 2009 – Dr. Charlotte Cowan, creator and author of the Dr. Hippo Series of Children’s Books, has been selected by the Obama Administration as one of the leading social innovators in the country. In an exclusive reception at the White House this week, Dr. Cowan was recognized by President Obama and members of his recently-formed White House Office of Social Innovation and Civic Participation. Dr. Cowan was chosen by the Obama administration for her five award-winning, creative children’s books aimed at educating parents and children about ubiquitous illnesses, decreasing family anxiety and reducing unnecessary and expensive reliance on doctor offices and emergency rooms. After training and practicing pediatrics for many years at Boston’s Massachusetts General Hospital for Children, Dr. Cowan formed the Hippocratic Press in 2004 to focus creatively on those illnesses that affect tens of millions of American families and cost billions of healthcare dollars. Dr. Cowan’s books turn time-honored Hippocrates into a kindly pediatrician and protagonist in her Dr. Hippo Series of children’s picture books. 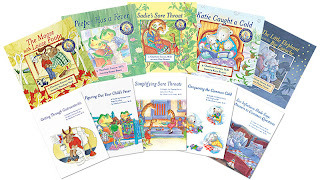 Each of Dr. Cowan’s books, The Little Elephant with the Big Earache, Peeper Has a Fever, Katie Caught a Cold, Sadie’s Sore Throat, and The Moose with Loose Poops, contains its own, separate Parent Guide. The Parent Guide answers common questions such as: “How can I help my child to feel better at home?” “When should I call the doctor?” and “When may my child go back to school?” Inherently entertaining and comforting, Dr. Cowan’s picture books educate both parent and child through repeated readings thereby empowering families to stay at home, to give their children excellent care, and to call appropriately for medical advice or visits. “I am greatly honored to be recognized by the Obama Administration’s Office of Social Innovation. I hope that today’s recognition accelerates my goal of using children’s stories, the Dr. Hippo Series, to get health education out of the pediatric office and into the hands of American families, thereby increasing the accessibility and affordability of excellent health care across America,” said Charlotte Cowan, M.D. Ear infections are responsible for 30 million office visits and more than 10 million antibiotic prescriptions annually. American children have 6-10 colds each year. These cause over 22 million lost days of school annually. Antibiotics are prescribed for 47% of upper respiratory infections -- i.e. the common cold, despite their lack of effectiveness treating cold-related viral infections. Fever is the most common complaint of children seen in the Pediatric Emergency Department. Approximately 7.3 million outpatient visits attributable to sore throat occur yearly among children in the US, and group A streptococcus is responsible for 15%-36% of cases. Sore throats, caused by both virus and bacteria, have significant infectious and noninfectious complications. Group A streptococci, the most common cause of bacterial pharyngitis among children and adults, are the leading cause of acquired heart disease among children throughout the world. Acute gastroenteritis continues to be a common illness among infants and children worldwide. In the US, diarrhea accounts for more than 1.5 million outpatient visits, 200,000 hospitalizations and 300 deaths per year. Dr. Cowan’s full color picture books feature child-friendly animal characters that entertain the reader, and combine empathy with education. In addition to making both children and their parents feel comforted and cared for as they face the inevitable illnesses of childhood, Dr. Cowan’s books also have an impact on child literacy. Already found in the Departments of Public Health of ten states where The Little Elephant with the Big Earache has been used for Antibiotic Awareness Outreach Programs, Dr. Cowan’s books are available nationally in bookstores and on Amazon.com. More information about the Dr. Hippo Series can be found at www.drhippo.com. This is a release from Dr. Cowan herself. Congratulations Charlotte. These books are indeed spot on and very helpful!